In today’s world, the internet plays a major role in business. To start your internet business you require two things domain and hosting, there are many hosting companies provides these services to the customers at various prices. We already know finding genuine web host and prices is much tougher for beginners and seo marketers. More & more web hosting companies are entering into real-world business to grab the customers with a different approach. Trusted web hosting companies provide 100% trust and uptime guarantee, whereas small hosting companies do not provide best quality service. So, pressure for quality hosting sites is much more difficult to find. So you are planning to start an online business or capable enough to start a blog that can gain massive attention. For this purpose, everyone tries to approach a proficient web designer & developer who can customize a website exactly as per the requirement. It is very important to make sure that all pages are optimized for better user experience. Apart from building a website, have you ever thought that how to put it on the World Wide Web? For this purpose, you need a web hosting service provider that can onboard your website on the internet. They have servers to make a website live so that others can find it by entering a URL or through a search engine. Web hosting services are basically of two types i.e. When it comes to a dedicated server, it is meant for providing you totally error-free & fastest connectivity with the outer world. However, it is very expensive and only institutions like enterprise level businesses or security services need it. On the other hand, a server on sharing base host multiple websites that can be 10, 20, 100 or 1000 too. Instead of searching for web hosting Services Company, we designed a special tool called web hosting checker tool to find quality web hosting sites from top bloggers and seo services company websites. The results only show the hosting service provider but, not complete details of the hosting plans like Shared, VPS, Cloud or dedicated hosting. The price of their services depends on the number of users. You will find numerous web hosting companies online offering their services & it is very confusing that which one is providing good quality hosting at affordable price. For knowing this secret, scroll down to gain more information. What is Website Hosting Checker? While starting a local business in the native market, every businessman tries to know the secret of success. They want to know the strategies that every successful businessman implementing in particular business criteria which is very difficult. However, it has become convenient to know the secrets of competitors if you are doing online business. The World Wide Web has many transparent policies that help you in checking the current business status of your rivals. This is possible with the help of tools like DA checker, Alexa traffic ranking, website hosting checker & website worth calculator. This article is about the importance of website hosting checker. It is a kind of online tool that you didn't need to install. Many websites are currently providing it for free of cost. What is web hosting? Why is it needed? Web hosting is a server located at a particular location where you can store and access your business data at any point in time. Each web hosting provides different plans and prices to the customers based on their requirement. Either the client can upgrade or down to various plans provided by the hosting company. Web hosting is needed for small businesses, bloggers, entrepreneurs, and entertainment sector to engage with customers and make a sale of their products or services. As the business grows, the clients will upgrade their hosting plans to reach right audience faster than competitors websites. Why do we need a Website Hosting Checker tool? A website hosting checker is an online tool that helps an owner to find the best service for his/her online portal. Here is some information to elaborate that why you need a website hosting checker. As a businessman, you must be curious to know what other competitors are already using to attain success. Whether it is the highest earning business of your criteria or newcomers, you can easily identify that whose server is providing the facilities. At the initial stage of a business, you need an affordable hosting service provider because of the limited financial sources. However, it must be proficient enough to handle the website with better loading speed. Also, the server needs to be sure enough to prevent you from all potential cybersecurity threats. The website owners can get an idea for choosing a hosting service at the time of onboarding. A website hosting checker tool helps in identifying the hosting service provider of other competitors. They go through the plans to make sure that which one is helping in their success. An already existing website requires proper health diagnosis to make sure that which hosting service can improve the response rate of a website. A bad server can be the reason for slow loading that affects the business badly. If your website is facing any issue regarding the performance, it can be from the development end or hosting server end. If a website is double-checked for optimization and already attained the best speed, it’s time to relocate to a new server. It is possible that the existing server is not able to handle the traffic because of the increased traffic or any other reason. There is no need to stick on a single server during the entire life of a website, you can shift it to a new server. Nowadays, most of the renowned web hosting companies are providing free of cost shifting facility. Before selecting a new hosting server, check the servers of competitors with website hosting checker tool. 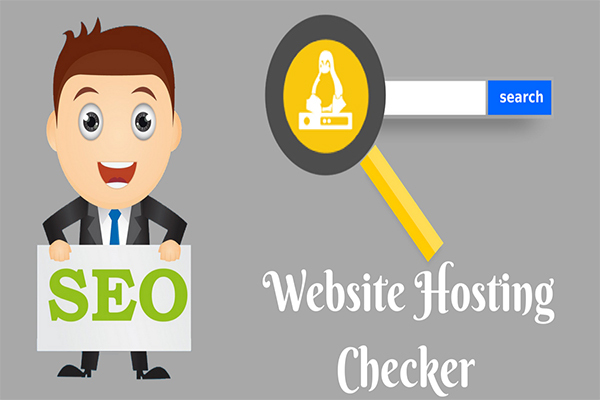 It is very easy to identify the nearest competitors and the most successful competitor too with help of website hosting checker tool. When you check the ranking of your website, it will also provide you with information regarding other websites dealing in the same business. Check their ranking to identify which one is more successful. After that, use the website hosting checker tool to identify their server. If you also opt for the plans that successful businesses are already using, it will surely improve the speed and security of a website. It is a clear fact that web hosting service provider implies a huge impact on the ranking of your website. Here you will come to know in detail how these servers are responsible for the ranking of a website. Websites that run swiftly & smoothly becomes the first choice of every end user. For a single service or product, you will find multiple online portals. However, everyone cannot provide the same level of experience. Some of them load quickly whereas others require more time even the pages are already optimized for the best speed. The internet speed in gradually or abruptly increasing in all parts of the world. People don’t want to wait for more than 3 to 4 seconds to load a page. If a competitor is already providing fast and error-free service, why users will choose the low performing website? No matter how good your SEO or paid marketing campaigning is. If the website with the topmost ranking on the search engine is not performing well, users will automatically shift to the second or third option. It badly affects the ranking, traffic rate, and conversion rate too that ultimately leads to a huge business loss. If you want to stay in the competition, it is essential to use the best possible services provided by marketers and hosting servers. The web hosting checker tool can help in enlisting the names of hosting service providers with a good reputation among your competitors. You just need to adopt the same strategy to improve the loading as well as a ranking of a website. How to use website hosting checker tool? To know competitor website hosting provider, it is mainly identified by the domain URL. With the help of website hosting checker tool, you can find hosting provider name by entering domain URL rather than subpage URL. A list of hosting checker tools is already mentioned above. Copy the web address of any tool and paste it in a new tab to open the website. An interface will appear where you need to enter the URLs of targeted websites. This tool can handle up to 1 URL at a time for checking their hosting service providers. After pasting the URL, click on the 'Check' button to initiate the search. It will take a few moments to execute the process and you will be able to see the hosting companies of all websites in a table. Along with the hosting company name, the table will also show you registrar detail & server IP. After concluding that which server is hosting most of these websites, you can contact them and subscribe to a plan according to the requirement. Final result it shows the IP address and hosting provider’s service name. What are the benefits of web hosting checker tool? It will help small business to find best hosting provider from competitor site. Not required any software and anyone can find with simple knowledge. A website hosting checker tool is helpful in identifying what your competitors are doing to attain a better ranking than you. The web developers get an idea regarding the requirement of a website as per the current trends. A low-performing website can get better of the problem is from hosting service side. Now you come to know the importance of a small but powerful tool that can tell the secret of a successful player of your business criteria. It is advisable to check at least 5 websites of your competitors before deciding to relocate to a new hosting service provider. To check hosting provider easily, either you can use this tool or use whois lookup tool.